I messed up my timing with this Bosnian World Cup recipe. I forgot to start the cevapi or the kajmak the day before, and had to rush the bread along so Adam could eat with us before going out. In the end, I made a rough approximation of the kajmak by mashing some feta cheese, cream cheese and Greek yogurt together… There is a detailed description of this recipe on the Cooked Earth website, which I had every intention of following carefully, but things didn’t pan out that way. We’d all be happy to eat this meal again – and if I do make a proper kajmak I’ll write about it then. In a large bowl, combine the lamb, beef, onion, garlic, parsley and paprika. Dissolve the baking soda in the hot water, and add that too. Season with salt and pepper. Mix together gently, until thoroughly combined without squishing it too much. Line a baking tray with baking parchment. Fill it with the meat mixture, spreading it evenly and patting it down. Chill for a few hours, or ideally overnight. Cook on the barbeque (or in a grill pan) over medium heat, three or four minutes a side. 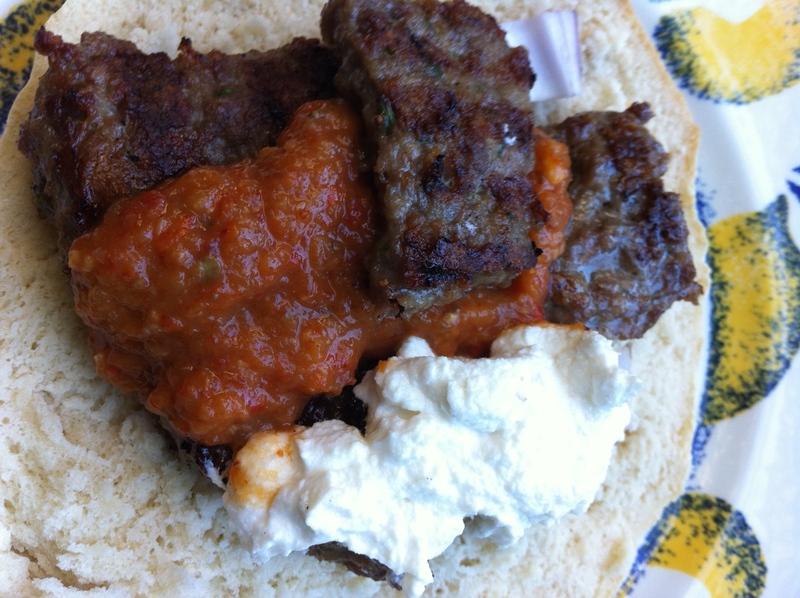 Serve on a piece of somun (recipe to follow), kajmak, a few pieces of chopped onion and maybe some ajvar. In a small bowl, stir the yeast and sugar into the warm water. Set aside for 15 minutes or so until it starts bubbling. In a mixing bowl, combine the flour, salt and baking powder. Pour the yeast mixture over the dry ingredients and combine. Knead the dough for about ten minutes, cover with clingfim and leave to rise until double in size (at least an hour). When risen, punch down the dough, then allow to rise again (about another hour). Punch down the dough again and knead briefly, then divide into four pieces. Shape each piece into a ball, and allow to rest for ten minutes. On a floured surface, roll each ball to about half an inch thickness. Cover with a tea towel and leave to rest for another twenty minutes. Remove the breads from the oven. Transfer to a bowl and cover with a dish towel for ten minutes or so to soften the crusts. Slice open and serve.